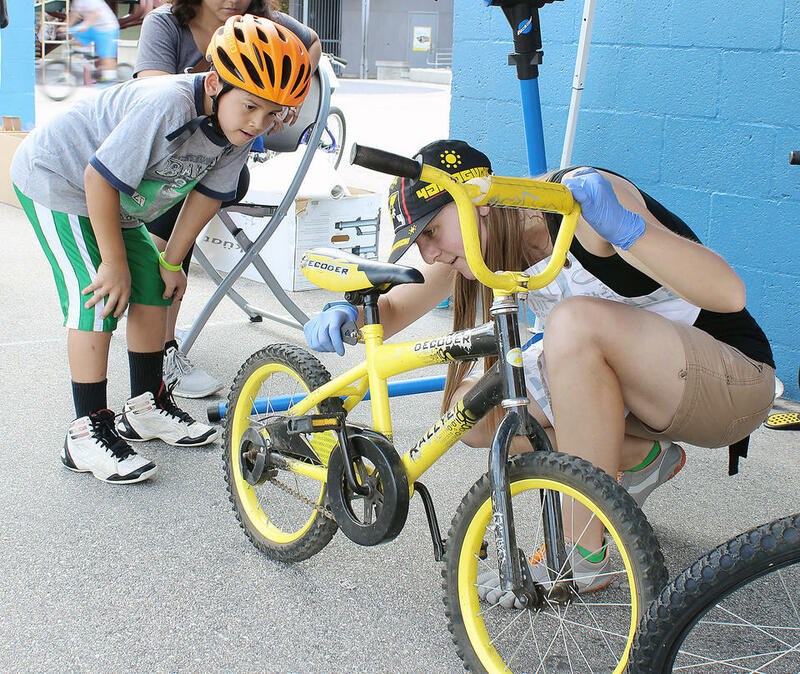 Kids Bike Day : Bikes. Rants. Adventures. I know it's been a bit quiet here recently, since I've literally been home only to sleep (and maybe scarf down some cereal here and there) I haven't had a chance to update what's new in my little world of bikes. This event happened a few weeks ago, but it was a lot of fun and I wanted to share it here. These kids were having such a blast, that they kept riding even when we started getting rained on. Young bicyclists got the opportunity to test their skills and learn new ones this past Saturday at the Kids Bike Safety and Skills Workshop held at Pacific Community Center. The event was put together by Walk Bike Glendale, a local nonprofit that advocates for safe walking and biking in the city, according to Nathalie Winiarski, community liaison for the organization. Walk Bike Glendale is a great organization that I discovered on Bike to Work Day this year - I asked if they needed any volunteers, and I was called regarding this event. They needed someone who could do simple mechanic work, to which I said "absolutely!" Though most fixes were simple, it was a lot of fun and a good learning experience for me, all of the kids, and their parents. I explained what I was doing every time, and was able to fix just about everything that came my way. I set up a bike stand and just brought the basics with me, which was perfect for this event. Ninety percent of "repairs" were just simple seat adjustments and demonstrating a proper bike fit. I also pumped up quite a few tires - all by hand! There were a few oddball fixes here and there, like truing one wheel and turning handlebars and forks around that had been installed incorrectly (just...yikes). The thing that really got to me was the poor quality of the brakes that I worked on, as many of these bikes had brakes that didn't touch the rims at all, and I feel bad for these kids learning to ride on something that can't stop properly! This little boy was awesome, though I felt terrible because that seatpost bolt was completely stripped and was just spinning in place. I didn't have the tools to fix something like that, and it was the only thing that slipped through the cracks. I'm sorry awesome little dude! I hope you were able to get it fixed and get back on your bike ASAP. It was non-stop chaotic work, but it was amazingly fun and I can't wait to do it again. The kids learned how to signal, dodge obstacles, stop at signs, do an ABC check, use lights at night, and much more. There were also lights and helmets given out, so everyone was riding safely. I'm glad to see more community events like this going on, both for kids and for parents. So many parents told me that they want the streets to be safer for their kids, and that they want to ride more with them - and many families rode to the event together, which was awesome. I have to say though, that the best part of my day was when kids would come up to me and proudly ask if I could remove their training wheels, and then fearlessly tear off back to riding around with their friends. Ride on, little cyclists!